See if candy dissolves faster in hot or cold water. Fill one cup with hot tap water and one with cold water (for better results, add ice cubes). Put one candy in the hot cup and one in the cold cup. Watch to see which dissolves faster. Because molecules move faster when it’s hot, the candy in hot water dissolves much faster. The candy in ice water might take all night to dissolve. With chocolate, the difference is even more impressive. Since the cocoa butter in chocolate doesn't dissolve in water, chocolate placed in cold water just sits there. But chocolate in hot water melts and mixes with the water. this expermint was such fun!! Thanks for the info. I recomnd doing this one! How Do I make a data graph on this? You could try graphing how long it took for Skittles shells to dissolve in different temperatures of water. It happens pretty fast, and it's something that you could probably put a pretty clear end point on--when the shell is gone, the white layer underneath is exposed. Otherwise you could try dissolving just about anything in various temperatures of water, just make sure that each cup contains the same amount of water and you put in the same kind of candy. Try using something with a colored shell that dissolves quickly, like Skittles, M&M's, or Nerds. Smarties and Conversation Hearts don't work as well. Can u help me? 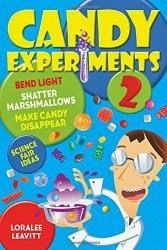 I'm doing this for my science fair project and I want to know if I could mix the candy? Can I use jolly ranchers? Can I use starburst? I really want to get an big fat A to bring my grade back up. I want your help about telling me more. Please I want to pass the seventh grade. For a science fair project, teachers often want to see you try to research and experiment on your own ideas. So if you have Starbursts, see if this experiment works with Starbursts. If you have Jolly Ranchers, try them too. See what happens if you flatten the Starbursts before the experiment, or crush the Jolly Ranchers. See if you notice results from one kind of candy but not another, and if you do, why might that be? If you conduct several experiments, and think about what is happening with each one, I'm sure you'll do great. Good luck! Can you break down the meaning of hypothesis? A hypothesis is a prediction--you're writing down what you think will happen when you do your experiments. Then you conduct your experiments and see if the results match your hypothesis. Here's the link to a blog post I wrote about science fair projects, which I just reposted on my blog. You can also learn more about science fair guidelines at sources like ScienceBuddies.org. Those will be good places to find answers to the rest of your questions. If you're asking how much candy to dissolve at one time, you'll just have to experiment and see what happens. Some dissolve pretty slowly. If you crush the candy, or use smaller amounts, it will dissolve faster than if you try to dissolve a big chunk of candy at once. The dependent variable is the variable that depends on what is changing in the experiment. In this case, the independent variable is the heat, and the dependent variable is the rate at which the candy dissolves. Great question! Experiment and tell me. It depends of course on how warm the water is, how much candy you use, whether the Jolly Rancher and Mentos are their original size or whether you crush them...so many variables.